The Angriest: Star Trek: The Next Generation: "Aquiel"
It is 1 February 1993, and time for another episode of Star Trek: The Next Generation. The Enterprise arrives at a relay station lying along the Federation-Klingon border. Its crew are dead. While investigating the crime, Lt La Forge (LeVar Burton) studies the personal logs of the late Aquiel Uhnari (Renee Jones) to find any clue to what actually occurred. When Aquiel turns up alive and well and in Klingon custody, the mystery only deepens. I have no idea why, or how it repeatedly occurred for the whole length of The Next Generation, but the series writers were fundamentally incapable of giving Geordi La Forge a normal romance. In "Booby Trap" they had him romance a hologram based on a real and unsuspecting person. In "Galaxy's Child" they had him meet the actual person he had copied, and actually have him somehow blame her for being offended - to the point where a weird creepy romance seemed to develop by the end. Here Geordi watches the personal video diary of a stranger, and then uses what he learns to chat her up. It's bizarrely awful, continuing the irregular process of making him the series' most unintentionally unlikeable character. When it is not continuing to turn Geordi into a 24th century stalker, "Aquiel" goes about generating a remarkably silly murder mystery. Aquiel herself is a suspect, as is a visiting Klingon, but in the end the culprit turns out to be a shape-shifting dog. There is something unintentionally hilarious about Geordi cowering in his quarters as a fluffy white dog transforms into an enormous brown blog, something that looks like a computer-generated cross between a beanbag and a turd. As far as shock reveals go, pushing your audience into fits of derisive laughter is probably not the effect originally intended. There is also precious little tension here, despite one or two reasonable promising twists. The discovery that Aquiel is alive and well should be a great moment, but it falls completely flat. Matters are also not helped by a relatively weak supporting cast, notably Renee Jones. 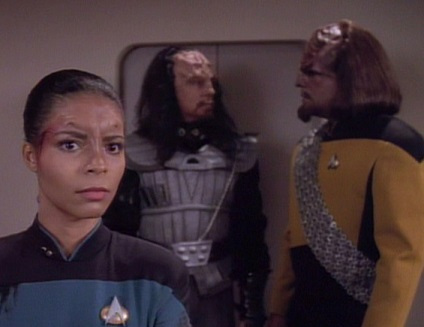 The character was developed as a potential recurring love interest for Geordi, but there is so little chemistry between the two that it's clear why she never returned. Either that, or she simply didn't appreciate Geordi reading her personal log. This is a profoundly dull episode, with very little to recommend it. It is not the worst episode yet made, but it is arguably the most boring. It leaves Season 6 with eight good episodes out of 13, and a quality ratio of 62 per cent.